ike sports cars or fine wines, kitchen blades have the power to inspire a serious fetish. All you really need, though, is a few reasonable-quality knives that feel good in your hand. These are Barry's basics: pairing knife, 8" chef's knife, 6.5" santoku, and well-used Chinese cleaver. (Dents on the top of cleaver are from smashing shank bones for stock.) Note wooden cutting board & honing steel to keep knives sharp. Chef and Santoku knives are OXO Good Grips. Cleaver cost a few bucks in Chinatown. Pairing knife bought secondhand from a knife sharpener. Let's get right to the point. Some may fantasize about a Ferrari or lust after a Lamborghini. I crave a Kyocera and swoon over a Solingen. These are knives. Like sports cars, they sharpen the senses. I can't look at a display of high-end kitchen cutlery without testing an edge or thinly slicing an imaginary fillet. Hold up a pot and everyone asks, “What's for dinner?” Hold up a knife and they're thinking, “You da chef!” When it comes to the kitchen, knives rule. Take the palm-sized (17.5 cm) Kyocera ergonomic ceramic chef's knife, the KC-150. It sells for $295 and comes with the claim that, unlike metal knives, it “has no taste or smell.” That's nice to know, but what I like is that it is so small and beautifully balanced that it feels like an extension of my hand. Then there's Global's vanadium-steel serrated boning knife. This is the only knife that food guru Anthony (Kitchen Confidential) Bourdain claims he needs. If it's good enough for the culinary world's food warrior, it's good enough for me. And how about the foot-long, $1,000 Japanese sashimi knife by MAC (pictured on Page D1) that was slowly handed to me from under the counter at Ares Kitchen and Baking Supplies? This marvel of hardened steel is made by the same artisan who hand-crafts samurai swords for Japan's royal palace. Holding it, I enter the zen of slicing. Oh boy, do I want that. But then my sharp-eyed inner cook cuts to reality, asking what I really need. For guidance, I go to Montreal caterer Philippe de Vienne, a self-confessed knife maniac. He has more than 50 meticulously sharpened blades, but he gets most of his work done with just four. Others agree you don't need to spend a lot to be on the cutting edge. Chef Jean Beaudoin teaches at Montreal's leading cooking school, the Institut de tourisme et d'hotellerie du Quebec. He recommends starting with a $50 chef's knife and a $15 paring knife for vegetables, fruit and boning. He suggests testing a 20-centimetre chef's knife, the knife most of us reach for, by trying to bend it slightly. 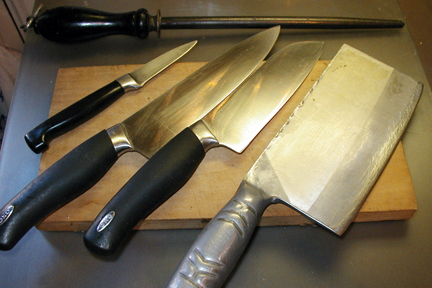 “A good chef's knife should not be flexible,” he says. At the Institut, students train on relatively inexpensive but professional-quality Italian-made Sanelli knives. These are balanced and comfortable. The sturdy, bright-green handles have a nifty retro look. While price and quality are important in choosing a good knife, coolness is never dull. The sharpest-looking line is definitely Global's innovative G Series. These are made of a solid piece of forged metal with a well-designed pockmarked grip. Most knives are set into a handle. Global's knife is the handle. At first glance, it looks intimidating; but these are gorgeous, lightweight and a pleasure to handle. No wonder Bourdain likes them. Knives have attracted a lot of attention lately because of our continuing love affair with sushi. The sushi chef doesn't keep to the kitchen; he is a performance artist, slicing effortlessly as he creates. If I want a knife with similar edge appeal, I'm tempted by the MAC line of high-carbon stainless-steel cutlery which its maker claims is the world's sharpest. MAC knives often have a line of scallops or dimples along the length of the blade. They give a cleaner and thinner cut, essential for finely slicing raw meat or fish. Many Japanese-made sashimi (raw fish) knives achieve the same thing by having an edge on one side only. These have a deceptively minimalist look, but the simple wooden handles and thin steel blades belie their sharpness. There are left- or right-handled models, depending upon which side is bevelled. These knives are also great for thinly slicing a carpaccio of beef or smoked salmon. They come in several lengths; the bigger the knife, the finer and longer the cut. Whether you are drawn to the practical or the pretentious, there are some common elements to good knives. Except for in the case of a boning or long slicing knife, which must be flexible, the blade should be firm. But the aspiring chef has to be careful: The ceramic Kyocera, for example, despite its elegance, isn't practical for most of us as it chips easily. Comfort is also important. Poorly balanced knives tend to be weighted too far forward and can be tiring to use after even a short while. A part of the blade should extend well into the handle. This is called the tang and is essential for stability and balance. Serrated blades, which include bread knives, are great for slicing. Paring, boning and the all-purpose chef's knives are best for cutting, chopping and dicing. If you can afford only one good knife, make it a 20- or 25-centimetre chef's knife. An interesting alternative is a Japanese style of chef's knife often called a santoku. It is a little smaller, and the blade has a less pronounced angle.